I deeply believe that one of our greatest crises in the United States, as well as much of the world, is our inability to achieve work-life balance. Although “crisis” may sound dramatic, I believe there is a case for it. The psychological and physical health costs are quite significant, despite the difficulty in calculating them. These costs are hidden under personal and family stress, fast food and other poor eating habits, and habitual stress. I come from a family of workaholics. Early in my career, 80-hour workweeks were not unusual for me and 60-hour-plus workweeks were the norm. I would often hear, “I don’t know how you do it all,” and would appreciate this as a compliment. It was not until later that I began realizing this was an indictment of a problem. My personal change came through love, relationships, and reflection upon existential values. While I spent many of my days talking about the importance of love, compassion, and relationships, I had trouble authentically living these because by all accounts, what was driving my life, or my ultimate concern, had become work and the development of existential psychology. Yet, the existential psychology I adhere to drives us to something beyond existential psychology; its ultimate concern is love and relationship. Yet, paradoxically, my commitment to existential psychology and work was interfering with my ability to authentically live it. This parallels what I’ve routinely witnessed in advocates of self-care: frequently, the individuals who teach and advocate for self-care are those who are the poorest at it and need it the most. As I recognized my inauthentic lifestyle, I reflected upon what were the deepest values I wanted to live in my life. The top priority was easy: my sons, my wife, and my family. Next in line were my friendships. The third value in my big three was living a life of passionate compassion, which included direct expressions of compassion and concern along with advocacy and activism. I recognized that until I began living these values, I had no right to teach and train people in existential psychology as I could not do it authentically. The shift is not easy. One of my first commitments in this change was that I began rarely working in the evenings or weekends, including appointments, phone calls, or emails. When I began implementing this, I would often have frustrated and angry emails on Monday because I had not responded to emails from Friday or the weekend. Over time, as I made my commitments to balance clear to colleagues and students, this boundary began to be respected. Yet, the volume of emails I have on Monday often still feels overwhelming. Frequently, all day Monday is nothing but catching up on email. I am also less efficient and responding to emails and everyone’s demands of me, including semi-frequently missing an email. While I feel badly for aspects of this trend, knowing that it comes out of a commitment to balance helps me accept this personal limitation. In a world where receiving 50 or more emails a day is common, a commitment to balance sometimes means that things will fall through the cracks. 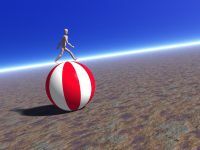 Trying to live a balanced life in an unbalanced world is not easy. I recognize that my ability to achieve some semblance of it is connected to my privilege. It is less easy for many, including my students who have to work, often full-time, to be able to go to school, and my colleagues who have to work two or more jobs to make ends meet. This is a sign of a broken system. We need a cultural change. The economy in the United States is one of the biggest challenges. Many individuals have to work multiple part-time jobs, or add part-time employment onto their full-time job, to make ends meet. Many employers are asking their employees to work more hours, take on more tasks, and be more efficient for the good of the company or to protect their jobs. Some fear that they will not have a job without working excessive hours. Furthermore, the willingness to put in many hours often seems more prized by employers than the ability to do good work. Yet, if the only way a company can survive is by exploiting its employees and putting their psychological and physical health at risk, then it should be asked whether it should survive. This is particularly true in mental health agencies where often therapists and other providers are worked to the point of severe costs to their own psychological and even physical health. For many, like myself, the love of what one does is a challenge. I love teaching, writing, and providing psychotherapy and supervision. They are not just things that I do for a paycheck—they are things I do out of love for these tasks and recognition of their meaning. If I were independently wealthy so that I never needed to work again and was not allowed to take a paycheck, I would still want to do this work for free. But I must recognize that I am better at this work when I live a balanced life. It negatively impacts myself, my students, my clients, and even my employer when I do too much. I am often not as efficient as I used to be and not as productive. For those used to my prior levels of productivity, they are sometimes frustrated with me for not doing as much or responding as quickly as they are used to. While I wish this wasn’t true, I am glad the reason for these limitations is that love of family and friends, concern for myself, and an authentic commitment to my existential values have taken over as my lived ultimate concerns.